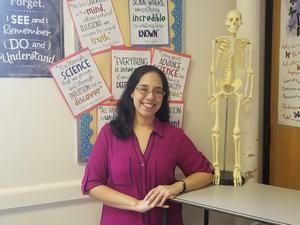 On March 5th, one of Union Hill Middle School’s amazing Science teachers, Mrs. Karina Acosta, was awarded $3,000 through the NSTA Shell Science Lab Challenge. The Shell Science Lab Challenge recognizes outstanding middle and high schools across the country for their exemplary approaches towards science lab instruction. Out of numerous entries from various schools throughout New York, New Jersey, and Pennsylvania, Mrs. Acosta’s application was selected the winner! With the support from Superintendent Silvia Abbato, UHMS’s administrative team and teachers, Mrs. Acosta was able to represent UHMS and showcase the school’s ingenuity, passion, and expertise in educating complex science concepts to their students. Mrs. Acosta plans to utilize the grant to further support UHMS’s high-quality science teaching and strengthen existing capabilities to ensure that UHMS students are prepared and “Destined to Succeed”. Congratulations to Mrs. Karina Acosta on being recognized from this prestigious award and making Union Hill Middle School and Union City shine!